Vitozza was one of the largest cave settlements in central Italy, and has over 200 dwellings excavated from the volcanic tuff stone. It was inhabited from Etruscan times (around 800 BC) until the end of the 18th century. We left Sorano the same way we had entered, through the Porta di Merli, then down to the Lente River. 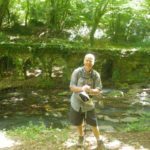 This time we turned upstream, and walked for about half a kilometer before climbing back up the hill to the highway above. I suspected we were only a couple of hundred meters from the town at this point, but the road was narrow with metal armco barriers on both sides, so it wouldn’t have been much fun to walk on. After crossing the river, we turned off the highway and continued through the forest for several kilometers. 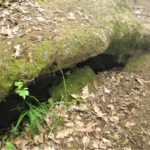 We could the remnants of an old stone aqueduct, and made a short detour to see where it started near a waterfall at the source of the river. 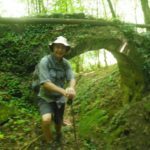 We returned to the main trail which climbed up out of the valley to the ruins of Vitozza. This ancient town was built along the side of a spur extending out into the valley, and the first ruin we saw was the “secondo castello” which protected the settlement from invaders coming from this direction. The area is now so overgrown that we might not have recognised we were passing by a ruin if our instructions had not mentioned it. 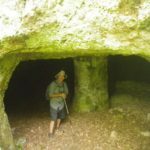 It didn’t take long before we saw the first cave house. It started to rain a bit at this point, but it wasn’t heavy so it didn’t deter us from exploring. Some of the caves were quite sophisticated, with several rooms, chimneys cut through the roof, and mangers cut into the rock for feeding animals. 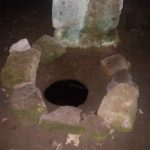 A few even had internal wells, with channels in the floor to direct any water that dripped down from above. After thoroughly exploring the first dozen or so, we got to the point where we just peeked into the entrance and continued on our way. This must be the first time in my life that I have walked past inviting-looking caves without feeling compelled to go inside! At the highest point of the spur we found the ruins of the main castle, which was built at the end of the 11th century by the Aldobrandeschi family. This had a moat (presumably dry) with a drawbridge, and a tower. It wasn’t enough to stop the settlement being conquered by the Republic of Siena in the 14th century. 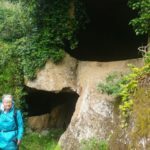 As we got closer to the town of San Quirico, we could see that some of the caves were still in use. The first few were filled with junk, but after a while they began to have substantial doors. The first houses at the beginning of the town had caves underneath which were being used for parking cars. Our path just touched on civilization before heading down a driveway towards a farm. 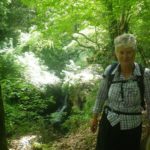 We skirted the farm buildings then continued along an attractive lane past olive trees, grape vines and then an orchard. We soon realised the trees at the side of the road were laden with tiny but delicious cherries, so progress became very slow. After we had consumed about half a kilo each, Felicity expressed concern about the possible effect on our digestive system so I reluctantly agreed to tear myself away. Fruit eaten directly from the tree always tastes superior in my experience. The final five kilometers or so were across paddocks beside a stream at the bottom of a bush-clad valley. We found it a bit of a slog because we had walked quite a way by this time and the track was quite uneven and overgrown. 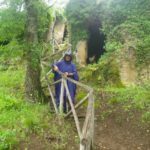 When we came to a spot where a large tree had fallen down and almost blocked the trail, I checked on our GPS to make absolutely sure we were on the correct route, and was relieved to find our destination of Pitigliano was just up ahead. As we walked up the hill towards the main part of town, we noticed a cat and a snake fighting near and under a parked car. We have been warned that there is a dangerous viper in Italy which can kill people, but it is usually not much longer than half a meter and has a large triangular head. This one was over a meter so we decided it posed no great danger to us, and stopped to watch the action. 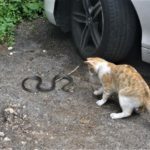 It soon became clear that the cat was doing the attacking, and was not the slightest bit intimidated by the snake rearing up and baring its fangs. The snake kept trying to hide under a car, but we could see from all the oil on the cat’s fur that this was not a successful strategy. Felicity made a few attempts to intervene on behalf of the snake, but the cat took no notice of her and as we were not sure that a snake living in a town where it might bite children was a great idea, we decided to let the law of the jungle take its course. We were rather exhausted and foot-sore at the end of our walk, which we figured was well over 18 km in length. It was very nice to take off our boots, have a shower and change into some clean clothes. Our hotel is called “Il Ceccottino” which means The Rabbit, so when we ended up at the Restaurant Il Ceccottino for dinner we had to order some bunny for one of our second plates. We had been told that we would get a 20% discount on our meal, but we looked so much cleaner and tidier in our evening clothes that our host didn’t recognise us and there was a bit of an argument until they figured it out. When we got back to our room at about 9.30 I fully intended to write this blog post, but made the mistake of resting for a moment on the comfortable bed and that was the end of my day. Very High Quality Travelogue . actually shows wonderful image of a cute cat and a reptile figuring out a workable relation ship . did you have some sort of a battery powered torch when exploring those caves ? 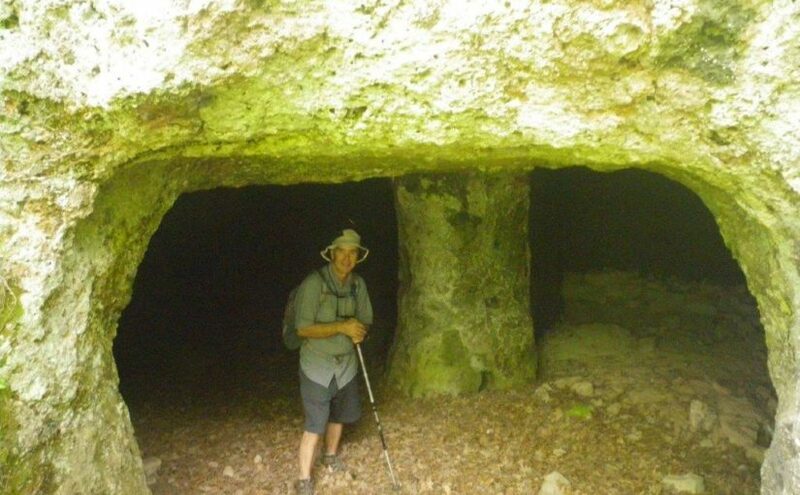 We do carry torches, but none of these caves go back very far so you can see without extra light.